You are currently browsing the tag archive for the ‘St. Croix’ tag. This was the view from my room in St. Croix looking out onto the beach. I love how there are always bent trees in the Caribbean. I miss the warm weather and the beach. Especially when today’s wardrobe included a fleece pullover, coat, scarf, gloves and hat. Brrrrr! Jim recently changed my tag on his blogroll. It used to just say Carol King. Now it says Carol King- artist, humorist, complainer. Complainer indeed. I prefer to think of it as social commentary. This is what I am going to comment (complain) about today. The price of kids T-shirts in these small stores in Park Slope. I wanted a size 4T shirt for a friend’s kid. I thought I might get a nice little “Brooklyn” t-shirt. I found one. It was $24.00. SERIOUSLY. For a t-shirt that the kid will grow out of in a few months???? And end up in a stoop sale selling for 50 cents or a dollar. A size 4T shirt is about 6″ across. I’ve seen men’s handkerchiefs bigger than that. I indignantly marched myself a few more blocks down the avenue to the next kid’s store only to discover that in this store the price of a kid’s t-shirt was $32.00 AND the collar was frayed. On purpose. WHAT? I’m now ready to buy a white t-shirt and write on it with a Sharpie. Are these people insane? Who are their customers? The stars that NAME their kids Brooklyn and Bronx? Cause it can’t be the people LIVING in Brooklyn and The Bronx. Only in NYC can people making $180,000 a year be considered middle income. http://envisioningdevelopment.net/map. Charlie’s wife Liz told me she wanted to have a nice old fashioned Christmas and have everyone give a home-made gift. Liz channels Martha Stewart and can make any dinner party elegant and wonderful. Her friend to whom she made this suggestion countered with “how about an ‘As Seen On TV’ Christmas?” Liz was outraged. Charlie and I didn’t think it was a bad idea. This did not go over well with Liz. Ah, the holiday season is upon us and everyone is in a good mood. Another Thanksgiving has arrived and I know that I am very lucky and have a lot to be thankful for. Among those things are you! OK, enough sappiness. 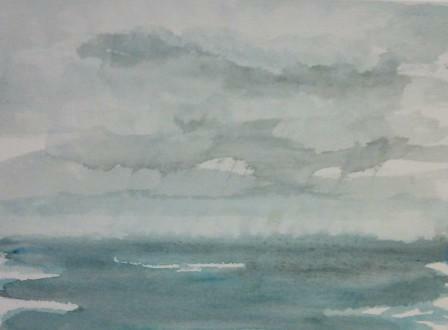 Here’s a quick sketch I did while waiting for breakfast on a cloudy morning in St. Croix. This was not in the Flamboyant Lounge, but the service was just as slow. Matt was off for a dive and my other vacation friends were heading home. After I ate, the sun came out and it was blazing hot. I went to the beach, sat down with my book, iPod, and sketch pad to enjoy some sun, quiet and ocean waves. And then it happened. Like a wall of locusts. A Disney cruise had just come to Carambola for a day excursion at the beach. As they ran down the beach towards the west end where I had just settled in, I heard someone screaming GET A CHAIR, GET A CHAIR. I turned, looked and was horrified at the vision in front of me. Hundreds of people with screaming kids. I took one look and I ran. Right back to my air-conditioned room and cable TV. I enjoyed a nice morning watching TV and knitting in cool, quiet and solitude. I was very thankful for that! I’m posting today even though I really have nothing to say. Not that that’s ever stopped me before. I remember one time in high school at “Our Lady of the Cigarette Smoking, Plaid Uniform Wearing, Know-it-all Teenagers” we we given a science project to do. I paired up with Mary Ellen. She did the whole project. The day of the Science Fair, lucky me, Sister Mary Don’t Wear Patent Leather Shoes ‘Cause Boys Will Be Able To Look Up Your Skirt In The Reflection came over to review our project just when Mary Ellen had stepped away. I started yapping until FINALLY Mary Ellen came back. She looked at me and said “empty barrels make the most noise.” I never forgot that. Which is surprising since this occurred in the 70’s and I don’t remember much from the 70’s. So that’s today’s post. An empty barrel. I now TRY to keep my mouth shut and listen. I sometimes think that we are only given a certain amount of words in a lifetime. So I try to use them carefully. Most times I fail. You know what happened to me, but for those of you who can’t stand the suspense, I’m pleased to report that Mary Ellen got pregnant in junior year by a transvestite, dropped out of high school and had a son she named Cannabis. 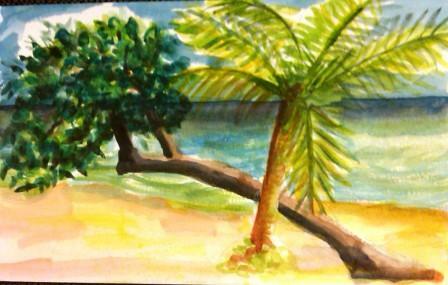 The above painting was another one done on the beach in St. Croix. And that’s all I’m gonna say. Who named that kid Rain? During the evening dog walk Charlie and I were having our usual stream of consciousness conversation when at one point he said that his wife, Liz was really into the group The Black Eyed Peas. Charlie: What’s up with The Black Eyed Peas. They all have strange names. apl.de.ap? will.i.am? Carol: I actually like will.i.am. It spells William AND it’s a backwards declarative sentence. Charlie: Only in a Dr. Seuss book! Carol: Remember when you wondered about The Edge of U2? You couldn’t get over the fact that his first name was a definite article. (DON’T GET US STARTED!!!) And then we got started…. Interlude whilst you think of all the kids you know with crazy names. A sister-in-law and a niece both work in schools and I love when I get the list of kids’ names. Including, but not limited to the siblings Tropicana and Rambo, and a young lady named Princess Precious Gorgeous. Then of course there was Nosmo King. (No Smoking.) No relation. And what’s up with celebrities naming their kids Brooklyn and Bronx? Do you think ANY ONE OF THEM has EVER been to the Bronx??? I mean there’s Island Time and then there’s Island Time. She was our waitress at the Flamboyant Lounge. I’m still waiting for my burger. St. Croix. And it’s amazing how quickly that relaxed feeling goes right back to stress and anxiety. So while I’m enjoying my last day of vacation before I go back to work tomorrow I will tell you a little bit about St. Croix. Pay attention. There could be a test. St. Croix is one of the US Virgin Islands along with its popular big sister St. Thomas where the cruise ships go and it’s rich baby brother St. John where all the rich people go. St. Croix is the middle child that tries really hard but no one pays attention to. But that was ok. It wasn’t crowded with tourists since the “season” hadn’t quite started yet. We went to visit Bonnie who lives there now. She used to live in Manhattan. Bonnie is the creator of my motto “Owtside begins with Ow!” which I blatantly stole from her and am not giving back. She is also the author of the someday to be bestseller “I used to have a concierge, now I have a machete.” She is very funny. There were other friends there as well and a good time was had by all. 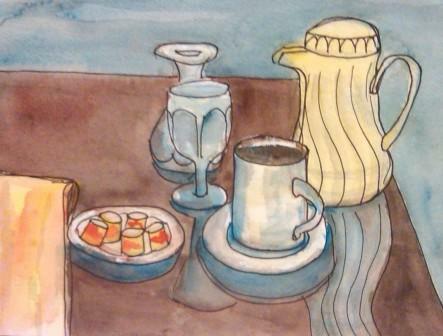 I was able to do a few paintings during the week in a watercolor sketchbook (5″ x 8″) I brought along with me. I would start a painting and then the lure of the waves called and I was back in the ocean. So there’s not as many as I would like. But I do have a few more to post. When I wasn’t painting, I was determined to finish this Reversible Cable Knit Scarf. Yes, I was mocked. Who brings knitting to the Caribbean? Oh. That would be me. Bonanza 5 holiday week & a finished beach scene! Wow, what a week this will be. 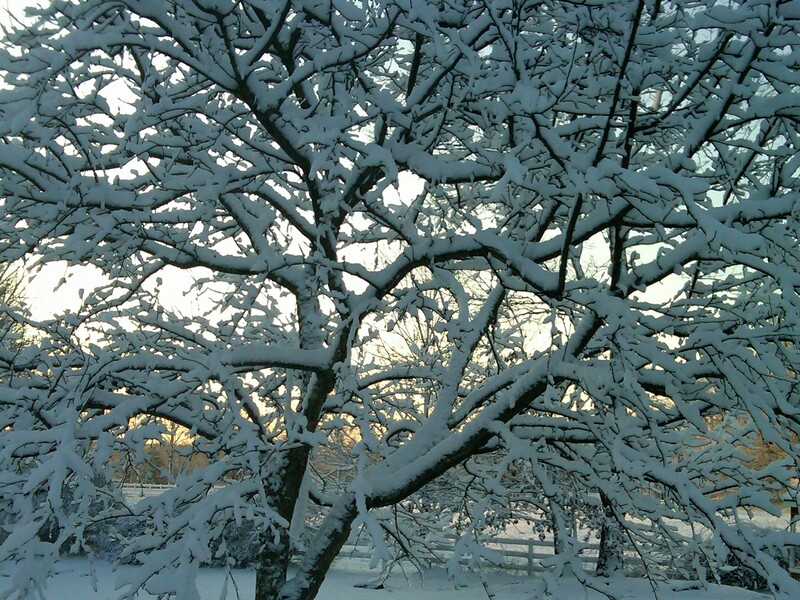 Today is the winter solstice! And tonight starts the eight nights of Hanukkah. December 23rd is Festivus (for the rest of us). I particularly like the “airing of grievances”. Then of course there’s Christmas, followed by Kwanzaa. I will celebrate them all. Why not! 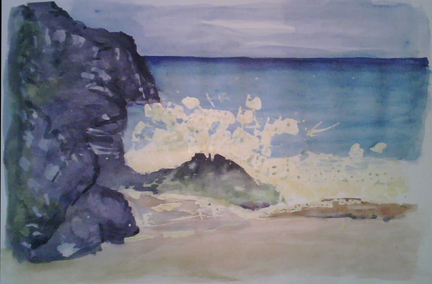 Since it’s the first day of winter as well, I thought it would be best to finish the St. Croix beach scene. It’s been treacherous out there. My poor sister and her family got stuck in traffic trying to get to the airport to fly to Alaska and missed the flight. The flight was actually ON TIME. Never, in the history of JFK, has a flight been on time during a snowstorm, but this one was!!! Go figure. But they all made to safely to Alaska and I have their dog. I am holding him for ransom. I haven’t decided yet what I will ask for his safe return, but I’m working on it. So with my dog and my sister’s dog, I have about 170 lbs of dog in my 950 square foot apartment. That’s about 5 1/2 lbs per square foot. And the aroma of wet dog fills the air when we all come back in after a walk in the snow and sleet and rain. Are you sure you want to visit Jim? Whatever holiday you celebrate, may it be a joyous one. I have to go dry off wet dogs. I’m still working on the beach. And wishing I was there. Why do they keep changing wordpress? As soon as I get used to it, they change it. I’m stuck on the rocks. I have too much work, too much holiday shopping to do and not enough time. May I be so bold as to consider that I am working on the third of a series, like my blog-o-sphere friend Bill when he did three paintings of leaves? I am doing a “season series”. I did the snowy trees, then autum leaves and now that it’s cold and dark and rainy in NYC I started working on a beach scene from St. Croix where my friend Bonnie lives. I also like the beach in the Caribbean. With the beautiful clear blue water, white sand, and palm trees I can almost relax. Maybe I should go more often. Practice makes perfect. This painting still has the frisket, or masking fluid on it. The rocks on the side of the the scene need more work and when I finally take the frisket off I hope that it will look like a wave crashing over the rock. If not then I guess I better purchase a ticket to St. Croix and do more research. Maybe even a plein air painting.